Whether you work full-time, part-time, or are a stay-at-home mom, the process of washing, drying, folding, and putting away laundry for the entire family, frankly, stinks. There’s no other way to put it (well, there is, but I won’t use improper language here). Confession: I’m a germophobe. As soon as I come into my house, I throw my clothes off and into the hamper (especially since I work in a school, and am totally convinced that I am covered in a ton of viruses and other delightful germs). The moment my children come home, the rule in my house is that they: take off their shoes, hang up their coats, and immediately peel off their grimy and paint/germ-covered clothing and throw it into the hamper. Then they re-wash their hands after touching the clothing, and before putting on their pajamas (or before taking a bath). Kidding! (Well, kind of. I’ve been trying to be a little more relaxed about that rule. Maybe a New Year’s resolution to be slightly less neurotic?) Ok, moving onto my husband, who spends his day supervising construction sites and coming home on the subway. The same rules about entering the house and disposing of dirty clothing applies to him, as well. So that winds up being a lot of laundry! So much laundry, in fact, that by the time the end of the week rolls around, the kids are cracking up about the “laundry mountain” that has built up in the wicker hamper in my room. One day, that hamper is just going to collapse under all the strain it’s put under. Seriously. I enlist my children for their assistance in as many household chores as they can manage; I have found that they actually enjoy helping me out, feeling a sense of pride and responsibility whenever they accomplish a task, no matter how small. I don’t do reward charts or incentives-they don’t ask, and I don’t offer. This has held true for setting the table, making their beds, and cleaning up their toys. The trouble was this: when I would ask them to put away their clothing, they would just throw everything into one drawer, in a crumpled mess. They were trying their best to put their clothing away, but didn’t know where things were supposed to go! Having the past week off from work, I have had time to think of ways to give my children more independence, while working on organizational, motor planning, and executive functioning skills. 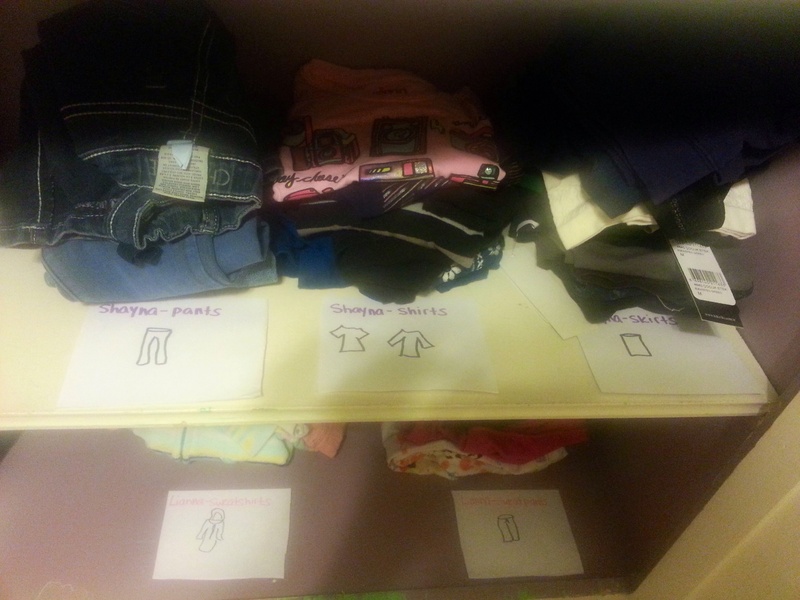 The idea came to me: to create color-coded labels, with written words paired with a visual picture, to show each child where specific articles of clothing should go. For example, for Lianna, she has one drawer dedicated to pajamas. I created a card that says: “Lianna-Pajamas”, with a picture of pajamas underneath. Since she shares a room with her sister, I color-coded Lianna’s cards with pink writing, and Shayna’s with purple writing. To make labels less noticeable, you can also place them inside the actual drawers. You can also substitute actual photos of clothing instead of drawings, or just do the writing alone if your child is a good reader/does not benefit from the visuals. Utilizing this new system has been a blast for my kids-putting away laundry is one of their favorite games! 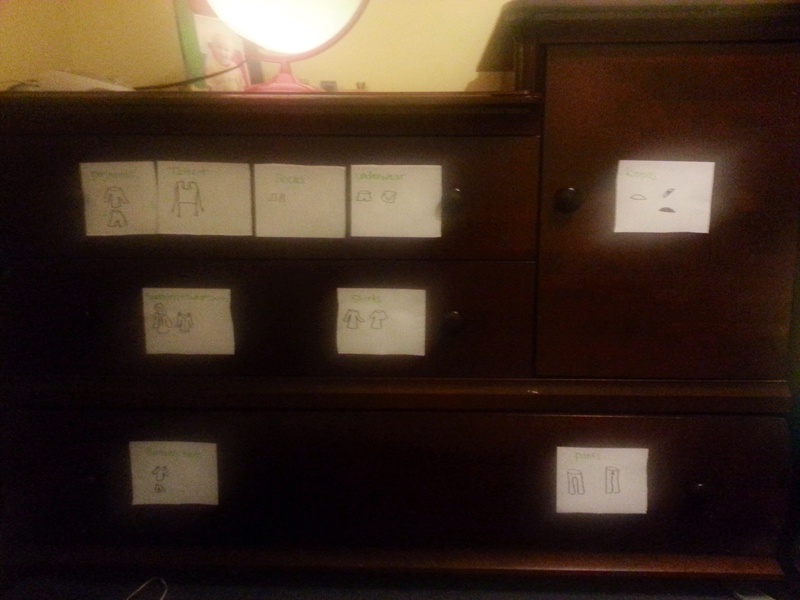 I feel happy knowing that I am fostering organizational and executive functioning skills, while also working on visual motor/perceptual skills (i.e-matching the clothing item to the label). But, I’ll be perfectly honest. This new system does two amazing things: 1. My kids now put away their own clothes, so I don’t have to, 2. This activity takes them a good 20-30 minutes (depending on the size of the load)-so I get 20-30 minutes of peace to drink my coffee. ‘Nuff said. Posted in Uncategorized.Tagged Executive Functioning Skills, Organization, Visual Perceptual Skills.